Sweet and salty isn't really a combination you'd usually associate with the word delicious - unless you're talking PB&J! Can you believe that we're already into ANOTHER season?! 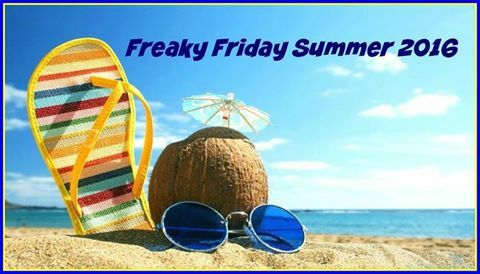 Which does of course mean it's time for the latest round of Freaky Friday! If you're just tuning in now, Freaky Friday is a seasonal event with participants made up of a lovely group of food bloggers who, every season, are secretly assigned to another blog from the group where they must choose a recipe that's really caught their eye, make it, photograph it, eat it, and blog about it. It's a really fun way to try something new and learn, post a recipe that might be a little different to what you'd usually find on any particular blog. and learn more about how other bloggers like to cook! This season (unfortunately in the depths of winter here...) I was excited to be assigned to A Dish Of Daily Life. Our host on this blog is the lovely Michelle of Connecticut, a truly talented cook, a mom to three teens, and author of anything lifestyle related; food, helpful how-to’s, her family's best travel adventures and tips, and a little bit of their daily life too. You've probably worked out by now that I chose the PB&J Bars with Strawberry Jam. My bars don't look anything even close to as pretty as Michelles, but that often happens when using US cups and measurements with metric cups and measures - funny enough, they're not the same! So although my bars weren't pretty, they tasted darn good! These bars are wonderful. They are super easy to make, really amazingly delicious (seriously, who can say no to peanut butter and strawberry jam?? ), they keep super well, and are a perfect lunchbox snack. 2 Line a 13 x 9 glass baking pan with foil, with extra over the edges. When your bars are done, you can simply lift them out of the baking dish. Grease your foil with butter. 3, Using a stand mixer or hand-held beater, beat the butter until smooth. 4. Add the brown sugar, peanut butter, and baking soda and continue to beat until combined. Then add vanilla and egg, continue to combine. 5. Add flour to mixture slowly and continue beating until well mixed. 6. Remove bowl from stand mixer (if using), fold in oats, and mix in by spoon. 7. Set aside about ½ cup of the dough, and press the rest of it into the bottom of your pan on top of the foil. 8. Spread strawberry jam or preserves across the top of the dough. Sprinkle pieces of reserved dough across the entire top. 10. Remove from oven, allow to cool. Once cool, remove from pan, and cut into bars or squares. What a great selection!! I love sweet and salty combinations -- they sound perfect!! Thanks for always being a part i=of our group! I LOVED cooking from your blog this month! Holy wonderful! I love the concept of this jazzed up version of a PB&J treat; fantastic idea and wonderful job with this post!!! These bars sound like a perfect sweet and salty combo! My husband would love to find these in his lunch box!! These look and sound so perfect!! I have to make a batch for me for lunch. Look so good. I love sweet and salty and all of Michelle's recipes are amazing—great choice! I have made these myself and we LOVE them! Yum Yum Yum! These are bars that bring me back to my childhood and make breakfast fun again! My kids would devour these, will have to give your recipe a try soon! This sounds so easy and delicious!! My kids are going to love this treat!! I love these yummy bars. I'm not really much of a baker, but bar cookies I can do! I'm so glad you got me this time around!